The Duchess of Cornwall, known as the Duchess of Rothesay in Scotland, after a ceremony at Elphinstone Hall, King's College, Aberdeen, to install Professor George Boyne (left) as Vice-Chancellor of the University of Aberdeen. The Duchess of Rothesay praised the resilience of the people of Aberdeen as she visited the city yesterday. She offered the Royal seal of approval to the new principal and vice-chancellor of Aberdeen University, George Boyle, as he was officially installed in the role. 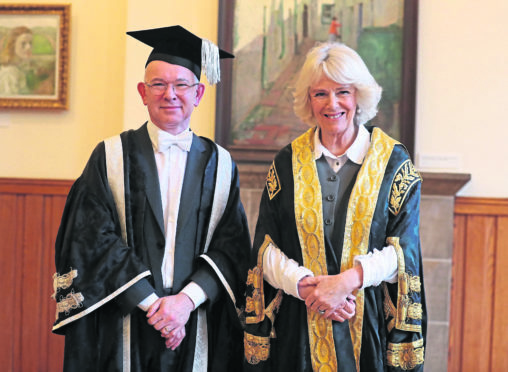 Camilla did so in her own role as chancellor of the university. Around 500 guests, including university alumni, staff and students, as well as senior figures from other universities, attended the ceremony at Elphinstone Hall. In her speech, the Duchess discussed history, noting that January 16 marked the anniversary of the Act of Union, as well as the date Scottish novelist John Buchan completed his first draft of adventure novel, The 39 Steps. She said: “May I congratulate you, Professor Boyne, on your new appointment. “Famously, John Buchan said ‘It’s a great life if you don’t weaken’. “Since you are an Aberdonian I know you won’t weaken, as Aberdonians are made of stern stuff. “Given your deep understanding and experience of public sector administration, I know that you will be more than equal to the challenges involved in running a great university in the twenty-first century. Camilla then highlighted the university’s commitment to fostering relationships with international students and academics, and wished the institution well with plans to create campuses in Australia and Quatar. Local initiative Food and Fun – set up to provide free meals during the school holidays to children in need – was recognised at the ceremony, with the founding partners presented with the university’s inaugural Principal’s Award for Outstanding Service to the Community. And an honorary degree was conferred upon Edward Stevenson, who worked in the university’s biomedical physics department for 42 years and supported the pioneering team that created the world’s first clinical MRI scanner. Speaking after the ceremony, Mr Stevenson said he was “extremely proud” to receive the accolade from the royal. The retired technician – awarded an MBE in 2010 for his services to healthcare and charity – is known to many Aberdonians for the festive garden display he used to create each Christmas in Ashgrove Road West, which raised more than £250,000 for charity over the years. Speaking after yesterday’s ceremony Professor Boyne, who is now the university’s 49th vice-chancellor, praised all those who had been recognised. He added: “It was a lovely ceremony and a true honour to be officially installed. “I was the first in my family to go to university and had no idea what to expect, but my parents encouraged me to work hard and apply. Yesterday’s musical performers included Dr Fiona Kennedy, who provided a rendition of Farewell to Tarwathie, and the university’s Chapel Choir, who sang Caledonia alongside Dr Robert Lovie and Raemond Jappy. Katie Mclennan, 19, was one of the choir members. She said: “Professor Boyne has come to almost every one of our performances since he came to the university and it is great to see how much he supports us. “I was delighted to be part of this special day for him. During her visit to Aberdeen, the Duchess of Rothesay met the teams undertaking groundbreaking research into women’s health at the Institute of Medical Sciences at Foresterhill. She took a tour of the centre’s laboratory, met with students and even tried her hand at a little research of her own. Her guide for the visit was Professor Steven D. Heys, who is head of Aberdeen University’s medicine, medical science and nutrition school. Professor Heys said: “Camilla met with some of our internationally-recognised researchers, students and funders, all of whom are making a real difference. “We took her to Professor Cosimo De Bari’s lab so she could see some science in action and meet with some of our students. Camila was also updated on the university’s osteoporosis research, of which she has a personal interest due to her role as President of the National Osteoporosis Society, which she has held since 2001. Professor Valerie Spiers, herself an Aberdeen University graduate, met with Camilla to discuss her breast cancer research. 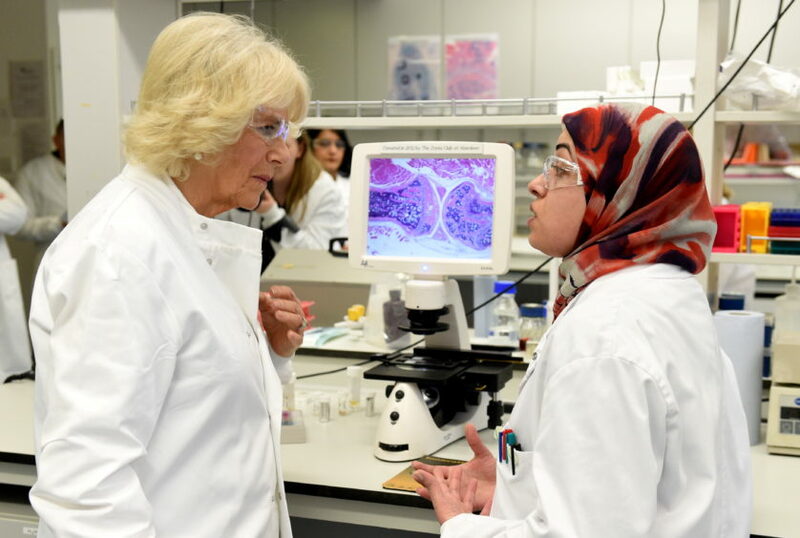 She said: “Camilla was very pleased to hear how our research is progressing and encouraged by our work with the younger generation.